VATICAN CITY, JAN. 24, 2007 (Zenit.org).- Benedict XVI is appealing to the media to educate children "in the ways of beauty, truth and goodness," not of violence and vulgarity. The Holy Father's appeal is in his message for World Communications Day 2007, which will be observed May 20 with the theme "Children and the Media: a Challenge for Education." 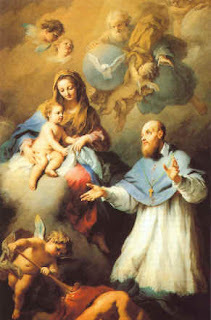 The papal message for the media day is traditionally published today, the feast of St. Francis de Sales, patron of journalists. The message calls for reflection on two aspects: the first is "the formation of children," and the second, "perhaps less obvious but no less important, is the formation of the media." The Pope explains: "The relationship of children, media, and education can be considered from two perspectives: the formation of children by the media; and the formation of children to respond appropriately to the media. "A kind of reciprocity emerges which points to the responsibilities of the media as an industry and to the need for active and critical participation of readers, viewers and listeners." The Pontiff adds: "Within this framework, training in the proper use of the media is essential for the cultural, moral and spiritual development of children. "Educating children to be discriminating in their use of the media is a responsibility of parents, Church, and school. "Media education should be positive. Children exposed to what is aesthetically and morally excellent are helped to develop appreciation, prudence and the skills of discernment." 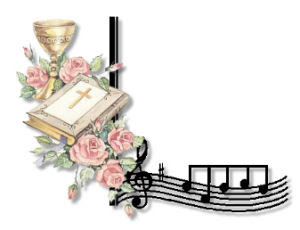 Benedict XVI's statement recognizes the importance of the example of parents and encourages them to introduce youth to "children's classic literature, to the fine arts and to uplifting music." "Beauty, a kind of mirror of the divine, inspires and vivifies young hearts and minds, while ugliness and coarseness has a depressing impact on attitudes and behavior," the papal message continues. The media industry can support the education of children in the ways of beauty, truth and goodness "only to the extent that it promotes fundamental human dignity, the true value of marriage and family life, and the positive achievements and goals of humanity," the Pope says. Benedict XVI acknowledges that communicators often face "'special psychological pressures and ethical dilemmas' ... which at times see commercial competitiveness compelling communicators to lower standards." "Any tendency to produce programs and products -- including animated films and video games -- which in the name of entertainment exalt violence and portray anti-social behavior or the trivialization of human sexuality is a perversion, all the more repulsive when these programs are directed at children and adolescents," he says. The Holy Father appeals in his message "to the leaders of the media industry to educate and encourage producers to safeguard the common good, to uphold the truth, to protect individual human dignity and promote respect for the needs of the family." sings for occasional services on and off campus. above address or by telephone at 740.284.5884. 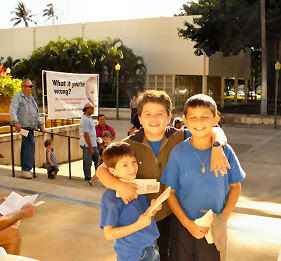 Members of the Our Lady of Fatima Catholic Homeschoolers of Hawaii at Monday's Hawaii March for Life. respected at all stages of development from conception to natural death. Click title above for to visit their site. "In 1997 the Vatican demanded the abuse of having extraordinary ministers of Holy Communion at all masses be eliminated entirely"
To learn more, click above. Heavenly Father, today is the anniversary of our son's birth, the day on which You allowed him to enter this magnificent world that You have made. We thank You for the child that You have entrusted to us. We want to cooperate with You fully in helping him grow into a free and responsible person and mature in the faith received at Baptism. by the good example of our lives, and by the loving observance of Your law and that of Your Church. Most of all, however, guide him with Your Spirit so that he may know the vocation You will for him and be open to genuine self-giving and true Christian love. Recently, I've been doing a lot of thinking about humility. I've come to the conclusion, that I really need to learn to be humble. 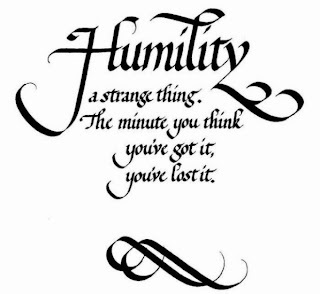 The real humility, and not the insincere, "look at me, look how humble I am" humility. Dean recently posted on this topic. He did a really good job on tackling the issue of humility from a different perspective. ...Now, in order for us to get anywhere, we have to start with the virtue that begins the dying process. Humility is the key to all of the other virtues. Without humility one cannot take any of the other virtues to heart because there is no space left inside the heart because it’s full of self. Now humility does not mean that you have to walk around telling people how lowly and unworthy you are. In fact, if you were to meet a truly humble person, you would most likely say to yourself, “Wow, he (or she) really listened to me and cared about what I was saying.” Humility gets rid of the you, while raising up others. This is one of the reasons why it is so hard, because it helps you to realize that the world doesn’t revolve around you! Humility truly allows us to gain wisdom and knowledge. This is because it helps us to rid ourselves of what we think we know, so that others can fill our minds and hearts with the true knowledge that we don’t know. In other words, humility is the softener of hard-hearts, and hard-heads. "SGT Hess, We do not ship to APO addresses, and even if we did, we would NEVER ship to Iraq. If you were sensible, you and your troops would pull out of Iraq. telephone interview Tuesday with FOX News, Khetani said he had fired the employee who sent the email, a claim that FOX News has not been able to confirm. He also said he has received thousands of phone calls to his home and business from people protesting the email exchange. Hess said that he has since found two mat suppliers who shipped to an APO address in Iraq. 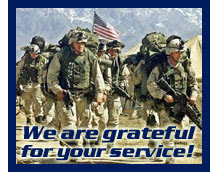 donate mats and other items to U.S. soldiers in Iraq. Often as Catholics we feel we lack the fire to evangelize. 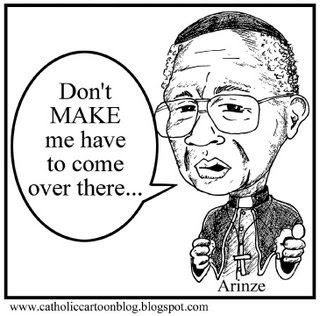 It is in fact our duty as a Catholic to evangelize in ways we can. Sometimes, it is just by our examples. which happened a couple days ago. Shrine in the presence of our Eucharistic Lord. Quick story: The original hangs at the Blue Army Shrine in Washington, NJ. My family and I visited there a couple of years ago. The kids in the family walked over to see this painting. Later some of the older kids came running to tell us that my 6 year old nephew, who shall remain nameless, actually touched the painting and said "that Hell isn't scary"! Let me tell you folks, the real one is beyond scary. We want to do everything in our power to avoid Purgatory, let alone Hell. When my sister was taking a class at Seton Hall University, she had a professor, a priest, tell her class that there was no hell. Out of all the students in the class, my sister was the only one who challenged him. To all of you non-believers: Common sense would dictate erring on the side of caution, right? Why take a chance like that? Ma Beck has two posts up on the subject of hell. 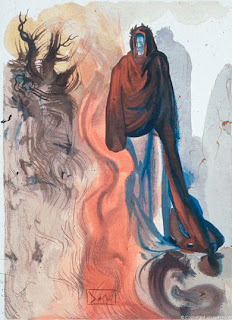 "As Our Lady spoke, she opened her lovely hands, disclosing beneath a sea of fire; and plunged in this fire were the demons and the souls, as if they were red-hot coals, transparent and black or bronze colored; with human forms, which floated about in the conflagration, borne by the flames which issued from it with great clouds of smoke, falling on all sides as sparks fall in great conflagrations -- without weight or equilibrium, among shrieks and groans of sorrow and despair which horrify and cause to shudder with fear. The devils were distinguished by horrible and loathsome forms of animals frightful and unknown, but transparent like black coals that have turned red-hot. "Here you see Hell, where the souls of poor sinners go," she said at length. 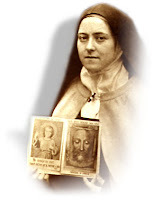 "To save them God wishes to establish in the world the devotion to my Immaculate Heart. If they do what I will tell you, many souls will be saved, and there will be peace." A Catholic Life has some good suggestions. If you live in a state that offers the Choose Life license plate, obtain one. It costs a little extra but the money goes to help support pro-life causes. Is This Any Way to Say Thank You????? See, this is the proper way of thanking the brave men and women who are protecting us. "An American GI assigned to one of the harshest posts in Iraq had a simple request last week for a Wisconsin mattress company: send some floor mats to help ease the hardship of sleeping on the cold, bug-infested ground. What he got, instead, was a swift kick from the company's Web site, which not only refused the request but added insult to injury with the admonition, 'If you were sensible, you and your troops would pull out of Iraq.'" Click above to read the entire article. Today is the feast day of Blessed Marianne Cope. She is the Franciscan sister from Syracuse who came to Hawaii to serve the lepers (Hansen Disease patients). 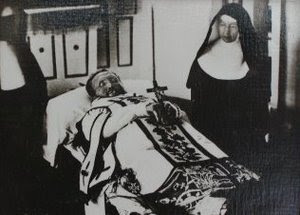 The photograph above is that of Father Damien on his deathbed and Mother Marianne Cope caring for him. we desire to remain in you. and never wither and die. Bl. Marianne Cope, pray for us! 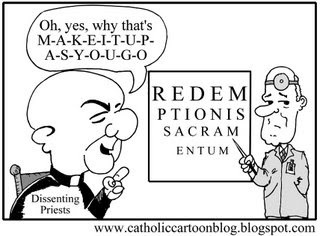 The following was posted today by Roman Catholic Blog Mahalo! In the disguise of ingratitude from friends. In the disguise of being misunderstood. In the disguise of failure. In the disguise of being dishonored. In the disguise of sickness. In the disguise of poverty. In the disguise of our daily work. 1. My child, nothing give you more trouble than your unthinking self. Until you have acquired control of your animal desires, your proud ambitions, and your foolish envy of others, you cannot enjoy My heavenly peace. 2. If your heart is not at rest, it is because you are still controlled by this blind self within you. Your heart is not set on Me, but on the comforts, enjoyments, achievements, or security of this life. Because you are so self-centered and full of worldly desires, you are tempted to sin. 3. Whatever is not from Me and leads not to Me, is bad for you. Some of the saints often asked themselves the question: 'How does this help me for eternal life?' That is a very valuable question. If you live by it, there will be less waste of time and more good work in your daily life. enough in what you should be doing. 5. You can make a better world by following Me. Begin with yourself. Learn My truth and let it govern your passions, your every desire, all your fears, and each word and deed in your daily life". "The man who has not learned to mortify himself, has within himself the enemies of peace and goodness. He is easily aroused against those who thwart or oppose his selfish desires. He sees the obligations of others, but he remains blind to his own He blames little things in others, while he excuses bigger faults in himself". "Do You Really Love Me"? "Then come to Me, vist Me before the Blessed Sacrament". Come to Me freguently before the Blessed Sacrament, especially, when you are hurtin gwith worry, fear, anxiety and pain and suffering of any kind. Get to know Me better so that I can better help you carry your cross". Joey and I joined a group of homeschoolers and other school children on Friday, to watch the a Honolulu Theater for Youth production. It was called A Thousand Cranes. The story is about a young girl in Japan named Sadako. When she was 2 years old, the bomb fell on her hometown of Hiroshima killing her grandmother, along with thousands of other people. When Sadako was 12, she fell during a race. At the hospital, she was diagnosed with leukemia. As you can imagine, Sadako and her parents were devastated by this news. Her good friend shared with Sadako a way she could get well. He told gave her a paper crane, created with origami, and told her that when she completed the thousandth paper crane, she would be well. Sadako begins to fold her paper cranes but she dies a little past the middle of her goal. This is a beautiful story based on a true story of a little girl in Japan during World War II. What makes the story even more touching is that Sadako's classmates end up finishing the 1000 cranes for Sadako, even after her death. Children all over the world send their paper cranes to the park as a way of honoring this courgeous young girl. This play was presented with a cast of three. It was done using Japanese artistic forms of masks, Butoh Dance, lighting, etc. "A Thousand Cranes is a play about ghosts--the spirts and memories of Sadako and those who were affected by the tragic bombing of Hiroshima. It is a play about connecting to the past in order to see the present more clearly. Why is Sadako's story told throughout the world? It reminds us that children are most often the innocent victims of war and of the continuing need for 'peace in the world.' The play consists of Sadako's memories and her eventual passing from life to death. The actors become numerous characters, melting from one to another in Sadako's stream of consciousness, which culminates in Sadako's retun as a spirit to tell her own story." Besides the books based on Sadako's story, you may be interested in reading A Song for Nagasaki by Paul Glynn. "A Song for Nagasaki is the story of Takashi Nagai, M.D., pioneer professor of radiology at the University of Nagasaki, who died of atomic disease six years after the second atomic bomb incinerated his wife and home. It is also the story of his spiritual pilgrimage from his native Shintoism to atheistic rationalism and then to a rationalist complacency disturbed by Pascal's Pensees. His heart, convinced by the fervor of the family he boarded with, converted to a lively Christian faith..."